DNAVEC Corporation (DNAVEC) is a workshop where scientists and engineers work together to realize their dreams of improving people’s health and conquering incurable diseases by exploiting front-edge bioscience and technologies to their full potential. DNAVEC is also a stage or base where the valuable efforts of our collaborators and supporters will come to big fruition. 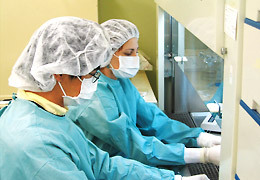 We believe that the promotion of creative collaborations with worldwide partners using our unique gene transfer technologies are the driving force of rapid and sure creation of valuable products and services. DNAVEC wishes to contribute to the human society not only by meeting the medical needs of numerous afflicted people suffering from chronic, hereditary, or infectious diseases but also by applying its technologies to wider use in bio-business in general. DNAVEC will perform its management with the merits of continuity, expansibility and multiplicity of the business that maximally utilize the broad applicability of its vector technologies. Sendai virus vector (SeV vector) is a vector based on the novel concept “Cytoplasmic RNA vector” that DNAVEC has successfully brought into practical use for the first time in the world. Its applications include a wide range of important bio-businesses such as gene therapy, gene vaccine, therapeutic antibody production, gene function analysis, and recombinant protein production. With this vector, DNAVEC is about to play an important role in medicine by bringing a new approach to the treatment of intractable diseases. A vector derived from Simian Immunodeficiency Virus (SIV). This vector is similar to Human Immunodeficiency Virus (HIV, AIDS virus)-based vectors in many aspects, which are now entering clinical trials in the US. Both SIV and HIV are members of lentivirus family, whose characteristics include capabilities to introduce genes efficiently into not only actively dividing cells but also terminally differentiated cells such as neurons, and to maintain gene expression for a long period of time. 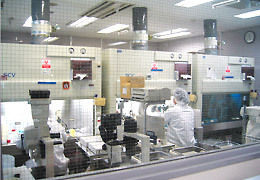 DNAVEC utilizes its own vector platforms such as Sendai virus vector in its business development, resulting in merits that are not readily available to other bio-companies. NEW YORK, NY; April 1 2013. The International AIDS Vaccine Initiative (IAVI) and DNAVEC announce the start of a multi-center Phase I clinical trial to evaluate the safety and tolerability of a novel preventive HIV vaccine candidate, SeV-G. Researchers also seek to obtain a preliminary assessment of the immune responses elicited by a prime-boost regimen of SeV-G and a vaccine candidate based on adenovirus serotype 35. This clinical trial is the first ever to test SeV-G.